The main topic of this chapter is the if statement, which executes different code depending on the state of the program. But first I want to introduce two new operators: floor division and modulus. An alternative is to use the modulus operator, %, which divides two numbers and returns the remainder. The modulus operator is more useful than it seems. For example, you can check whether one number is divisible by another—if x % y is zero, then x is divisible by y. If you are using Python 2, division works differently. The division operator, /, performs floor division if both operands are integers, and floating-point division if either operand is a float. n%2 == 0 or n%3 == 0 is true if either or both of the conditions is true, that is, if the number is divisible by 2 or 3. The boolean expression after if is called the condition. If it is true, the indented statement runs. If not, nothing happens. pass          # TODO: need to handle negative values! If the remainder when x is divided by 2 is 0, then we know that x is even, and the program displays an appropriate message. If the condition is false, the second set of statements runs. Since the condition must be true or false, exactly one of the alternatives will run. The alternatives are called branches, because they are branches in the flow of execution. elif is an abbreviation of “else if”. Again, exactly one branch will run. There is no limit on the number of elif statements. If there is an else clause, it has to be at the end, but there doesn’t have to be one. Each condition is checked in order. If the first is false, the next is checked, and so on. If one of them is true, the corresponding branch runs and the statement ends. Even if more than one condition is true, only the first true branch runs. Although the indentation of the statements makes the structure apparent, nested conditionals become difficult to read very quickly. It is a good idea to avoid them when you can. A function that calls itself is recursive; the process of executing it is called recursion. If n <= 0 the return statement exits the function. The flow of execution immediately returns to the caller, and the remaining lines of the function don’t run. The rest of the function is similar to countdown: it displays s and then calls itself to display s n−1 additional times. So the number of lines of output is 1 + (n - 1), which adds up to n.
In Section 3.9, we used a stack diagram to represent the state of a program during a function call. The same kind of diagram can help interpret a recursive function. Every time a function gets called, Python creates a frame to contain the function’s local variables and parameters. For a recursive function, there might be more than one frame on the stack at the same time. 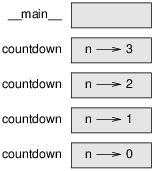 Figure 5.1 shows a stack diagram for countdown called with n = 3. As an exercise, draw a stack diagram for print_n called with s = 'Hello' and n=2. Then write a function called do_n that takes a function object and a number, n, as arguments, and that calls the given function n times. If you encounter an infinite recursion by accident, review your function to confirm that there is a base case that does not make a recursive call. And if there is a base case, check whether you are guaranteed to reach it. The programs we have written so far accept no input from the user. They just do the same thing every time. Python provides a built-in function called input that stops the program and waits for the user to type something. When the user presses Return or Enter, the program resumes and input returns what the user typed as a string. In Python 2, the same function is called raw_input. The error message indicates line 5, but there is nothing wrong with that line. To find the real error, it might be useful to print the value of ratio, which turns out to be 0. The problem is in line 4, which uses floor division instead of floating-point division. You should take the time to read error messages carefully, but don’t assume that everything they say is correct. An operator, denoted //, that divides two numbers and rounds down (toward negative infinity) to an integer. An operator, denoted with a percent sign (%), that works on integers and returns the remainder when one number is divided by another. The boolean expression in a conditional statement that determines which branch runs. A statement that causes a function to end immediately and return to the caller. The time module provides a function, also named time, that returns the current Greenwich Mean Time in “the epoch”, which is an arbitrary time used as a reference point. On UNIX systems, the epoch is 1 January 1970. Write a script that reads the current time and converts it to a time of day in hours, minutes, and seconds, plus the number of days since the epoch. Write a function named is_triangle that takes three integers as arguments, and that prints either “Yes” or “No”, depending on whether you can or cannot form a triangle from sticks with the given lengths. Exercise 4 What is the output of the following program? Draw a stack diagram that shows the state of the program when it prints the result. What would happen if you called this function like this: recurse(-1, 0)? Write a docstring that explains everything someone would need to know in order to use this function (and nothing else). Read the following function and see if you can figure out what it does (see the examples in Chapter 4). Then run it and see if you got it right. Figure 5.2: A Koch curve. The exception is if x is less than 3: in that case, you can just draw a straight line with length x. The Koch curve can be generalized in several ways. See http://en.wikipedia.org/wiki/Koch_snowflake for examples and implement your favorite.